After being in ‘junk’ for six years, Croatia is once again among investment class as S&P Global Ratings decided to lift its rating to ‘BBB-‘. Looking at the bond market, Croatia was investment grade for some time as spread tightened significantly, so agency’s move looks way overdue from that perspective. Nevertheless, spreads could continue going south due to large funds that have limit to invest only in investment grade instruments. What was the driver and what to expect next read in this short article. 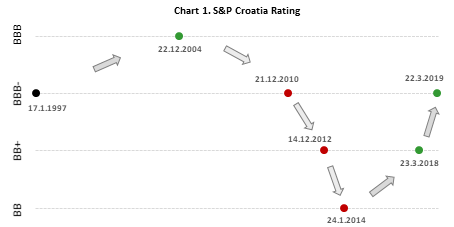 Exactly twenty two years ago all three credit rating agencies set Croatian credit rating at ‘BBB-‘ (lowest investment grade) with stable outlook and since then Croatia managed to climb only to BBB few years before GFC. However, crisis took its toll and Croatian GDP fell significantly, government’s debt climbed to above 85% in the beginning of 2015, entering EDP, while unemployment skyrocketed to above 17%. In 2013 Croatia fell to ‘non-investment’ class by all three major credit rating houses and back then it seemed like things could get even worse (i.e. lower than BB, two notches below investment). However, exports exploded due to EU membership and tourism sector, wages finally started to rise, fiscal deficits were limited to below 3.0% and after double dip recession Croatian economy finally started to revive in 2015. To sum-up, despite many challenges that Croatia witnessed in the last few years (several political disorders, Agrokor, shipyards etc.) it managed to consolidate its finances, post fiscal surpluses in both 2017 and 2018 and put debt on a strong downward path. 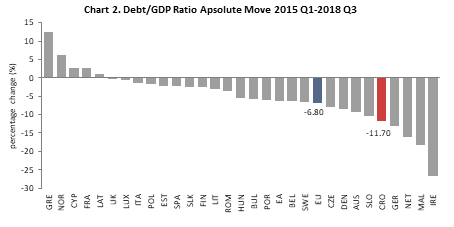 Just to put things into perspective, Croatian debt as a percentage of GDP fell from 86.2% in 2015 to below 74% in the end of 2018. Also, external debt significantly decreased as current account surpluses were driven by EU funds withdrawals, tourism revenues and sound exports. Meanwhile, CNB managed to increase its FX reserves meaningfully, as a result of its intentions to curb overly aggressive appreciation of Croatian kuna. Furthermore, S&P’s analysts mentioned Croatian intentions to join ERM II in 2020 which would decrease its risk premia further. Last but not least, S&P praised some important structural reforms that Croatian government implemented, such as third round of taxation reform, pension reform and finally educational reform that “could help address labor market bottlenecks in the longer term”. S&P said that they could raise rating in the next few years in case Croatia’s economic growth proves resilient on European deceleration as that would ensure wages in Croatia to converge towards EU’s averages. However, we doubt that could be the case as Croatia becomes more and more included into European supply chains meaning that it would suffer from deceleration of its main trading partners, especially as exports became large part of its GDP. How did the market react to S&P’s decision? 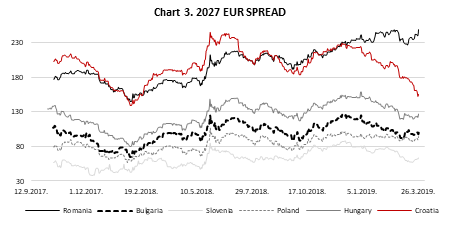 Well, looking at Croatian Eurobonds, it seems like Croatia was in investment grade class for quite some time now as risk premia was falling throughout 2019. Looking at the Chart 3. submitted below, it’s evident that all premia fell besides Romanian as a result of dovish central banks and never-ending hunt for yield that pushes investors on the edge of Europe. However, Croatian risk premium decrease was the strongest. What to expect further? As we mentioned above, there are some subjects on the market that are limited in investing only to investment grade instruments, so we wouldn’t be surprised in case pressure on Croatian Eurobonds continue although we do not expect yields to reach Hungarian levels in the short-term ceteris paribus. Nevertheless, one should mention that with every roll of debt, Croatian interest expenses decreased, and this could be the case for many more years, backing up further fiscal consolidation and decreasing debt. On the other hand, European economy clearly shifted into lower gear and some analysts are expecting mild recession in the next 12-18 months which should be a real test for Croatia.